Fort Calhoun, NE- Move over cattle, corn, and soybeans. Alpacas might be the new cash crop for Nebraska. Just ask Sherri and Mike Jacoby. She and her husband have been farmers for nine years. "We were driving and saw this lady walking some kind of animal with a harness. I didn't know what it was. I told my husband to turn around, and when we got out- I though it was going to give us a kiss!" she said. Jacoby says she immediately fell in love. The couple, with professional backgrounds in hospital pharmacy and construction found a new calling. Sherri says the medical care of the alpacas was easy with her pharmacy background, and Mike took care of the design and layout of the facilities. "They're just such neat animals and it's hard not to like them," she said. 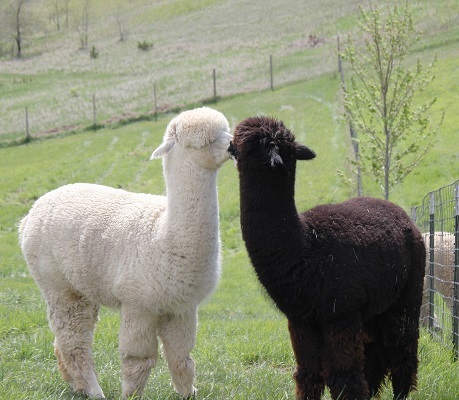 Alpacas look a lot like llamas, but they are not. An alpaca is a domesticated species of South American camel. It resembles a small llama. They're bred specifically for their fiber. Alpaca fiber is used for making knitted and woven items, similar to wool. Sherri sells her wool and a variety of items at a boutique above the farm. Not all alpacas spit, but they can Sherri says. Spitting is mostly reserved for other alpacas. Below is the link that you can copy and paste into the internet to watch the video!! !